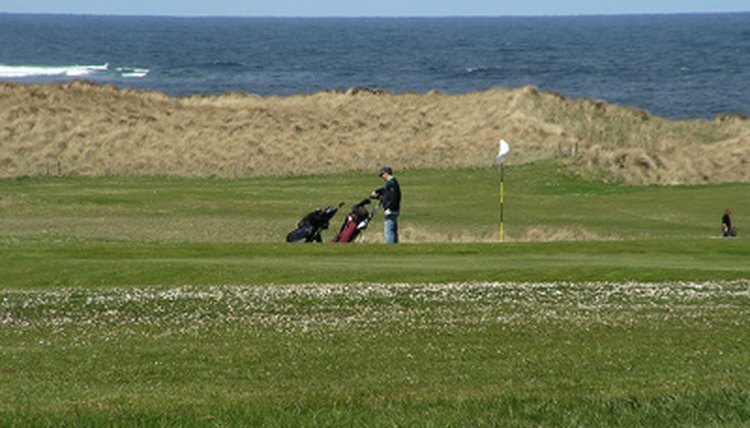 Windy days can play havoc with your golf game. A windy day can make a big difference in how you approach the game of golf. Everything is accentuated when a ball gets in the wind, including any spin. The ability to keep the ball low can minimize the effect that the wind has on your game and keep you scoring low, even while those around you are walking away with bogeys, double bogeys and worse. Hitting low requires some adjustments in your stance so that you actually remove some of the clubs loft at impact. Line up your shot from your normal address position. Move your grip to choke down on the club. Halfway down the grip is normally good. Don't go to the point of discomfort. Move the ball back in your stance. With a normal stance, the ball is generally centered between your feet. You'll want to step forward, removing half the space between the ball and your back foot. Lean slightly forward in your stance, so that your weight has been positioned approximately 70 percent over your forward-facing foot. Hold the forward body position through impact and follow through to keep the ball lower and better able to fight the wind.